But New Bern got pummeled by hurricane Florence last night, and it’s hard to tell the amount of damage or how worse it may get. I find myself unable to think about much else, and while the quality and density of available information is amazing — big thanks to science, journalism, and social media — I want more. 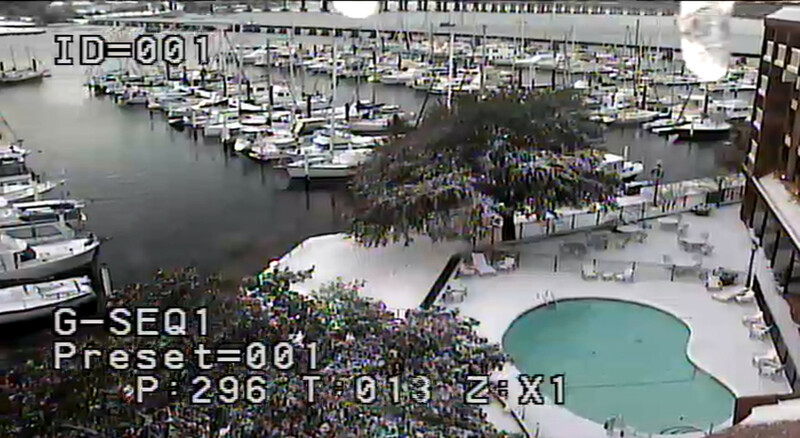 Last January I used NBGM’s live webcams to monitor another abnormal weather event (details at the end of my hydronic boat heating ode), but they went down yesterday afternoon. I had looked around evening before and the marina was similarly full of boats, no surprise as they consider themselves a safe harbor and were taking in refugees up until Tuesday according to their Facebook page. I wouldn’t argue a bit with that “safe” characterization, but Florence might. At about 5pm last night I did find a Life Eye 9 webcam, now dead, that’s high up on the Bridge Pointe Hotel looking across that marina to the Alfred Cunningham Bridge, and the situation did not look good. The float ramp sloping the wrong way to shore is one bad sign and so is the normal 14-foot vertical clearance at the bridge bascule. And soon I was watching intrepid WRAL reporters deep wading in the sweet little Union Point Park seen beyond the bridge. 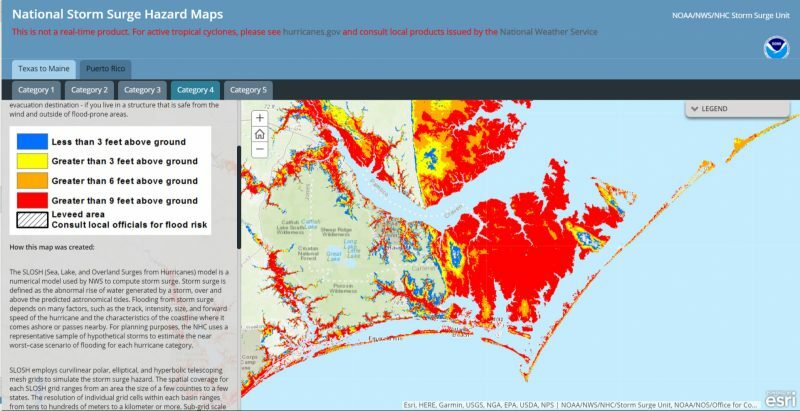 I often turn to the Weather Underground Category 6 blog when trying to understand meteorological complexity, and that’s where I had already learned about NOAA’s Storm Surge Hazard Maps. So I knew that New Bern was darn vulnerable to surge despite its distance from the ocean, at least according to the SLOSH model. 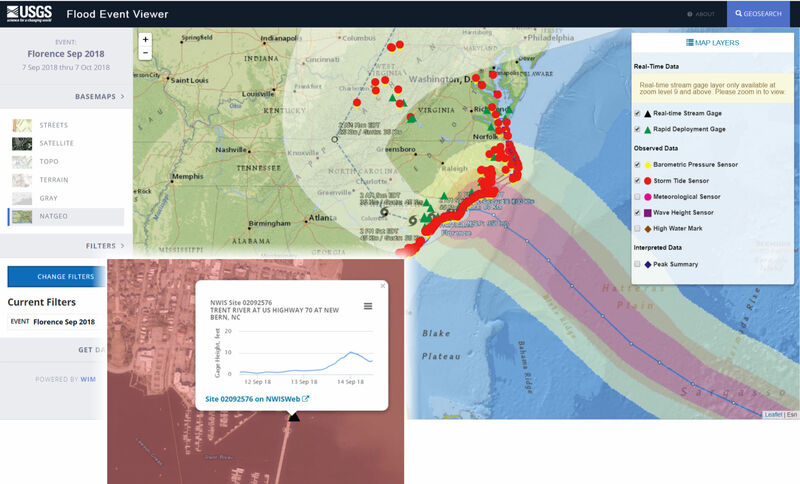 And when I screenshot the interactive surge map above set at Category 4, I was being somewhat conservative given Dr. Masters’ warning about a “Category 5 flood threat.” But finding realtime surge levels was a challenge. 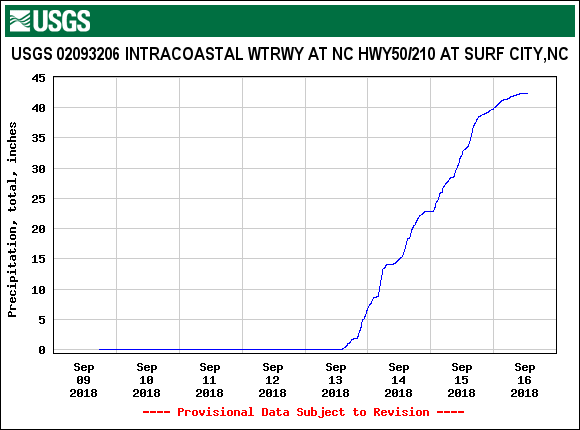 NOAA’s Storm QuickLook does nicely track a few precision coastal surge monitors (also seen at SURGEDAT) but the 3.5 feet above predicted tide I was seeing late last night at the fairly nearby Beaufort station didn’t seem close to what was happening in New Bern. It wasn’t until I tried Twitter this morning — I think it was a search on “nc water levels” — that I learned about the excellent USGS Flood Event Viewer (screenshots above). 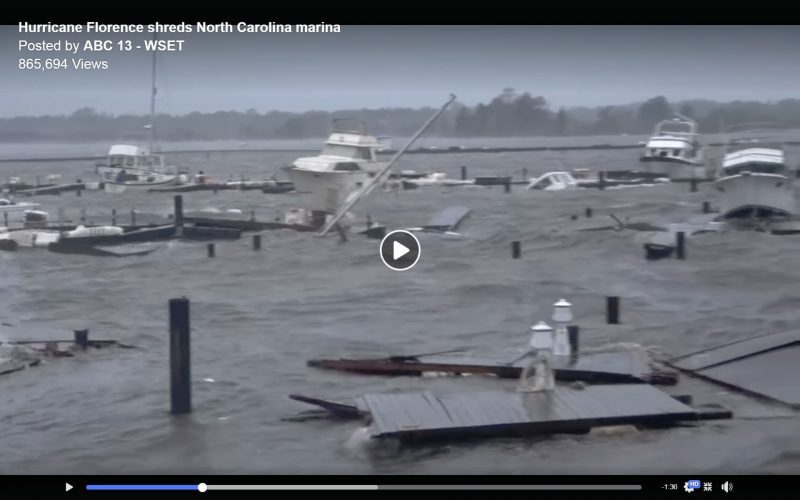 There’s lots of news coverage today about the 10-foot surge in New Bern, plus the roof blowing off the Piggly Wiggly and many rescues from flooded homes. So it was great to see the water level going down this morning, and not good to see it turn up again while Florence is nowhere near done in the area. I realize that it’s pretty pointless to obsess over something I can’t do anything about, and also that recreational boats are inconsequential in the bigger scheme. And also deeply thankful that so far there have been no reported fatalities in Florence. But all that said I welcome tips about other ways to monitor this major weather event, especially the marine aspect. Besides the New Bern waterfront, I’m also quite curious about Osprey Marina near Myrtle Beach, South Carolina. 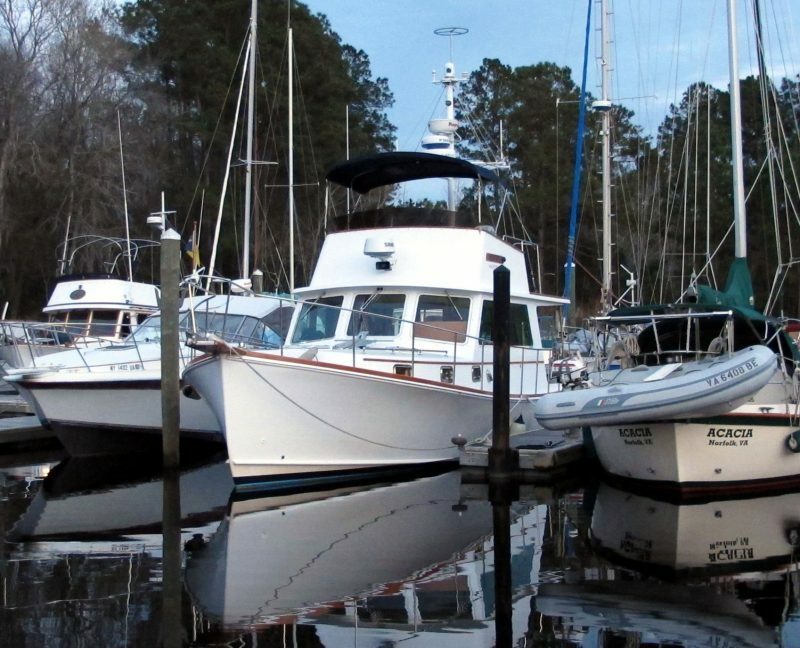 Literally dug into the woods along the upper Waccamaw River, it is the safest-seeming marina Gizmo has enjoyed in my 10 years of ownership. But then again — and maybe this is the point of my research — I’m recalibrating my notion of safe. 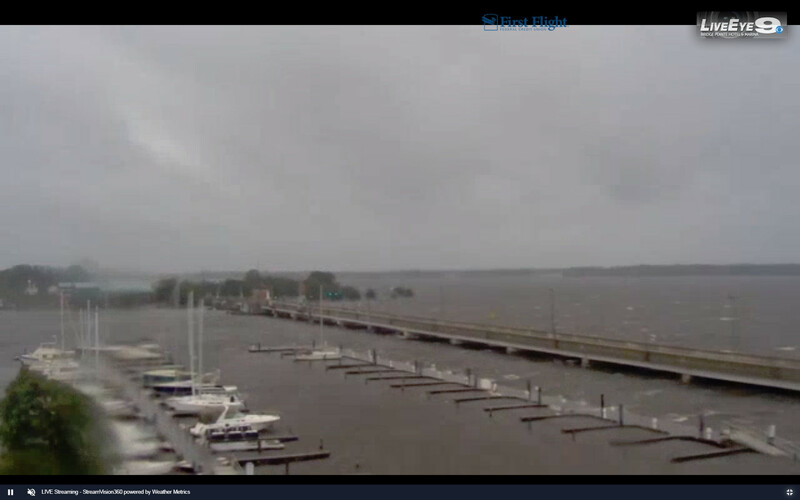 Thanks to USGS, I know the lower Waccamaw water level is actually going down right now, but Florence is about to move over slowly dumping massive rainfall on top of any surge; will it top those pilings? 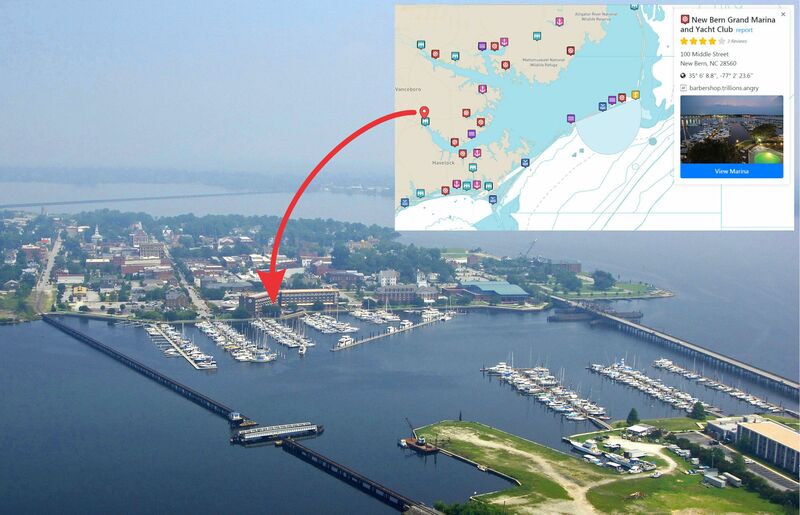 The Bridge Pointe Marina in New Bern has been destroyed and many boats sunk. NBC25 News in Raleigh shows has a video from Brandon Clement showing the destruction. Sorry, Henry, our comments crossed. But also I don’t see the video at your link (though I did see the link at the same Facebook page). At any rate, a lesson to me; if Gizmo was at Bridges Pointe right now, I might well have thought her safe. I looked here https://towndock.net/harborcam and it appears the camera hasn’t updated since yesterday. Not sure if there’s another one that’s still working. Oops, not paying attention; Patrick’s webcam also stopped streaming yesterday. A New Bern friend tells me that about 25 boats stayed at Bridge Pointe, and he thinks the docks would have survived without them. I don’t know about that but he was smart enough to haul his here… https://www.hurricaneboatyard.com/ …and hightail it to Maryland. …including one showing that Oriental got to 9.2 feet, though down to 7 now. Any information on how Osprey Marina fared? We are scheduled to be there this fall for several weeks.